I think of Yorktown as a hidden jewel waiting to be discovered. It easily makes our "Cheap Family Vacation" hall of fame, yet remains unspoilt by crowds. It's kinda like Cinderella. While people generally flock to Colonial Williamsburg and—especially after last year’s America’s 400th Anniversary--Jamestown, this attraction is like a poor cousin…thrust in the background by her better-known relatives. Without Jamestown, there might not be a New World. Without Williamsburg, there might not have been a Revolutionary War. But without this little hamlet, we might still be eating tea and crumpets. Okay, so I DO eat tea and crumpets (thanks to an English mom), although I prefer scones and pound cake with my afternoon tea. But few Americans realize the crucial role that this village played in U.S. history, as the location of the final decisive battle that gained our independence from Britain. 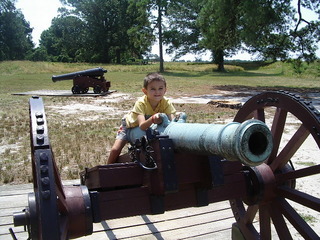 Just one of many cannons to climb on at the Battlefield. The village also has lots of free concerts and events (click here for the schedule). Plus, there's a free shuttle to save your feet. It’s a bargain too. Tickets to the National Park’s Battlefield are a better deal than the nearby Yorktown Victory Center. The Battlefield is just $14 for adults, a fee which gets you into Historic Jamestowne for no extra charge...and is good for 7 days. Be sure to take a spin on the free trolley. On October 19, 1781, British General Charles Lord Cornwallis and his army was forced to surrender to General Washington’s combined American and French army. And Cornwallis didn't take it like a man, either. Upon hearing of their defeat, British Prime Minister Frederick Lord North is reputed to have said, "Oh God, it's all over." And it was. The victory secured independence for the United States and significantly changed the course of world history. This town is like a mini version of Williamsburg. A pristine combination of historical attractions, carefully preserved buildings, and unusual shops and boutiques. However, unlike Williamsburg, it has few crowds, and actually boasts a more striking setting, perched on a series of hills overlooking the York River. It wasn't always a lovely spot. Frankly, except for its historical attractions, the village used to be a real dive. That all changed a few years ago with the addition of Riverwalk Landing, a quaint collection of shops and restaurants on a beautifully-landscaped brick-lined waterfront. Now, before I tell you about the shops, I have to be honest: they're what some men refer to as "chick shops." 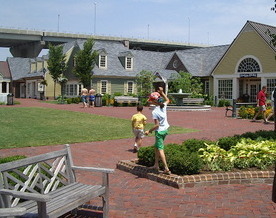 Plenty of room to run and shop at Yorktown's Riverwalk Landing. When we went there at Christmas, my brother-in-law, James, kindly offered, "Rule number one: Do not bring men...I need stores with stuff that plugs in!" Auntie M's American Cottage - an upscale tourist shop selling everything from patriotic-colored and rhinestone studded cowboy and baseball hats, and red, white, and blue attire, to toy soldiers and American novelties. Here's a link to a Google map of the town. 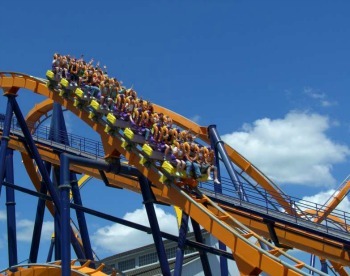 The town is located about a 20-minute drive west from Newport News/Williamsburg International Airport, about one hour west of Norfolk International Airport, and about one hour east of Richmond International Airport. Colonial National Historical Park is just a short drive from (I-64). If you're coming from Richmond on I-64, head east and take exit 242B for Yorktown, to the Colonial Parkway, then continue until you see the signs. If you're coming from the Virginia Beach/Norfolk/Hampton area, head west on I-64 and then take Route 105 East (Fort Eustis Boulevard east), which is exit 250B. You'll take this to Route 17 (also called George Washington Memorial Highway). Turn left onto Route 17 and follow the signs to the Battlefield. Although it is possible to walk from the town to the Battlefield and back, it gets a little hilly, so take advantage of the free Trolley. If you're driving to Williamsburg or Jamestown, you'll take the Colonial Parkway, a very scenic 23-mile drive. The Historic Triangle Shuttle offers service between Historic Jamestowne, Yorktown Battlefield, and the Colonial Williamsburg Visitor Center between March 16 and November 1. It's free, but you'll need boarding passes which you can get at the Colonial Williamsburg Visitor Center or at the information desk at the Battlefield. The town is a little off the beaten path, so it's not directly accessible by public transportation. If you're taking public transportation, there are AMTRAK stations in Williamsburg and Newport News. 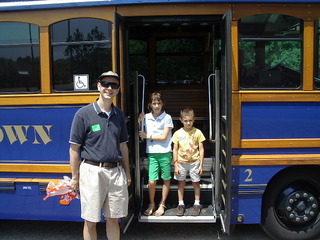 Greyhound has bus service to Newport News and Williamsburg also. From there, you'll have to get a rental car or taxi, unless you use the Historic Triangle Shuttle (see above). Carrot Tree Kitchens phone number: (757) 989-1999.